HVS boilers are for the combustion of untreated, split, wood logs with a log length from 33 up to 100 cm according to boiler size. You can choose between two different designs, either with lambda control (HVS LC) or without (HVS E). 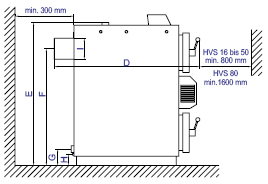 The boilers are available with a nominal heat output in 16, 25, 40, 60 and 100 kW. Little effort from refueling to cleaning! Just fill in logs, light the wood and everything else is working fully automatically. The large fuel chamber provides a long combustion period. The integrated fan guarantees an unproblematic start. The heating up flap and its safety door lock do not give way for smoke emission. Moreover, the combustion is stabilized throughout the whole combustion period by the fan and enables an unproblematic operation. Even the boiler size with 25kW can comfortably be filled with 0,5m logs through the large fuel chamber door. An overlength of the logs is, at least to some extent, no problem due to the depth of the fuel chamber. Long refueling intervals are the result of the large filling capacity. An increase in performance and very good exhaust gas values are achieved by a „hot air duct“ inside the tank. The outstanding concept of the HVS boiler which has been further developed by permanent innovations has now reached the next generation. The permanently increasing environmental impact by dust and CO2 urges the industry on new developments and more modern technology in all areas. 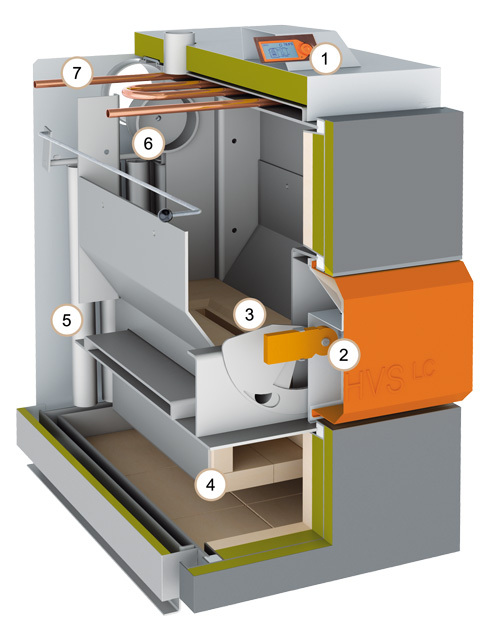 A modern and modular control concept of our wood log boiler series HVS LC ensures more performance and a low, environmentally friendly pollutant emission due to the serially integrated lambda sensor which observes permanently the exhaust gas values. With the help of the integrated boiler and exhaust gas logic the intelligent control recognizes the requirements of energy. 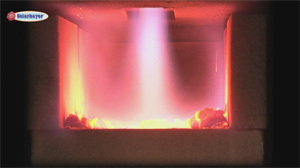 Due to the modulating air supply the boiler is able to react to a possible power reserve and can therefore ensure an almost perfect exploitation of combustibles. This means the highest possible comfort for you and a steady and even combustion for your wood. You can only achieve an optimal efficiency factor with a perfectly aligned system. Therefore, we generally recommend our high quality stratification tanks SLS with integrated, patented, stratification system. 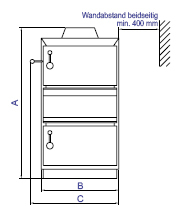 The produced heat of the wood log boiler can be perfectly stored in this kind of tank. The stored thermal energy is relieved into the heating system when needed. This keeps your fuel consumption as low as possible and even preserves the environment. 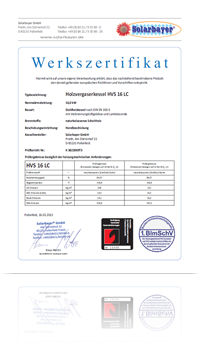 The HVS Economic achieves very clean emission values even without lambda control. Due to the use of latest control technology a product was created which under-runs the already determined exhaust gas requirements. You can make the best possible use of the combustible with this boiler series and you also respect the environment. Each model is equipped with the electronic combustion control. The permanent observation of the exhaust gas and boiler temperature means perfect comfort for you and a steady and even combustion for your logs. The physics of the combustion process has been adopted from nature and integrated into our boilers in an excellent way. The logical cooperation of exhaust gas and boiler temperature in certain intervals is used to add the combustion air in an optimized way. the quantity of air, necessary for a perfect combustion is supplied by the infinitely variable forced draft fan, equipped as standard. The secondary air is adjusted by the lambda sensor via a servo motor (only LC), depending on the emission values. With the boiler series HVS E the secondary air is adjustable via regulating screws. 1) Regulatory framework and government grants should be paid attention to. 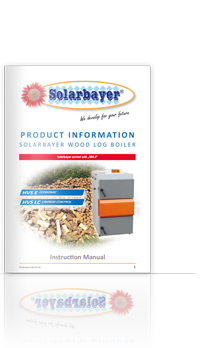 Planning aid for dimensioning wood boilers and calculate the boiler size depending on daily heat requirements. You will find several drawings of installation examples for wood log boilers, oil/gas boilers, as well as solar systems and heat pumps in combination with our high efficient storage buffer tanks. Technique easy explained - What is a wood gasifying boiler and how does it work? 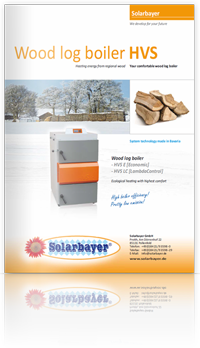 Find out more in this movie about the principle and operating mode of wood gasifying boilers Solarbayer HVS. Sorry, unfortunately this video cannot be played, because your browser seems to do not support this type of video format. If you want to watch the video be sure that you have actualized your browser to the latest version or use a browser of a newer generation.